The Correas family arrived in Mendoza at the end of the 16th Century, with Mr. Pedro Correas de Larrea, who married Mrs. Beatriz de Videla, native of the province. From that origin, members of the family have actively participated in the economical, political, and social life of the province. When Argentina became an independent country, Mr Juan de Dios Correas governed during three opportunities, with important developments for the province. The viticulture history of the family began in 1860 with Don Segundo Correas, who planted noble grapes of French origin, and built the first winery. In Medrano, Julian Correas founded the winery ‘El Cypress’, famous for the Cabernet Sauvignon in the 30s. Our father, Mr. Luis Segundo Correas, third generation of this traditional family, continues and increases just like his predecessors. In 1972 in Medrano, Mendoza modernized the present winery at Tres Acequias Street, with extra capacity in accordance to the increase of the vineyards which their father planted in 1925. 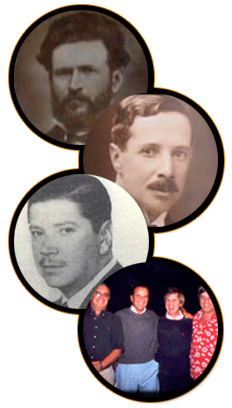 This allowes them to elaborate exclusively with their own grapes, a tradition which today is maintained by his children, Luis, Julian, Francisco and Diego, solely part of the society and the only family with the last name Correas in the province of Mendoza. Luis Segundo Correas’ Vineyards and Winery participated in the Argentine market and in the exterior. Julián Correas, Valle Las Acequias and El Ciprés, are brands for the Argentine market. Julián Correas, Luis Segundo, Valle Las Acequias, El Ciprés and Cuatro Ríos, are the brands for export. Exports are directed to the UK, U.S.A, France, Canada, Germany, Switzerland, Japan, Brazil and the Caribbean Islands. At the Luis Segundo Correas Winery we elaborate fine wines of the highest quality, from our own vineyards, with specific techniques. Respecting the artisan philosophy imposed on by our ancestors, the actual directors added technological advances, new know-how and modern facilities to optimize the process of wine-making. The direction of the vineyards and winery is performed personally on a daily basis by its owners, fourth generation of this traditional family, who has maintained the company in constant growth and novelty presence in the international Market.